The Italian verb for fight (each other) is the reflexive -ERE verb combattersi. ... imagine people in the Italian colours fight each other in COMBAT! Combattersi (per) can also mean: to contend (for). - combattere (v) : to fight, to combat, to battle, to challenge, to struggle..
- l'combattimento (nm) : battle, combat (military); match, bout (sport). - la combattività (nf) : fighting spirit. - combattivo (adj) : combative, hard-fighting, pugnacious. The meaning of verbs can change when in the Reflexive. They often show action done to each other or between each other, and use the Reflexive Pronoun (mi, ti, si, ci, vi, si). Reflexive verbs also take essere in the compound tenses and the Past Participle agrees in number and gender with the subject. Imagine people in the Italian colours fight each other in COMBAT! non combatterti (non) si combatta! (non) combattiamoci! (non) combattetevi! (non) si combattano! ✔ Combattersi is a regular, reflexive -ERE verb. ✔ Learn combattersi and it will reinforce the pattern for many other -ERE verbs. ✔ Do the daily verb every day for a month and you will have a solid knowledge of the -ERE verbs' conjugation patterns. Each month a new family of verbs is featured. ✔ You can more easily remember words and verbs like the Italian for fight - combattersi using the techniques of the world's Memory Masters. 200 Words a Day! 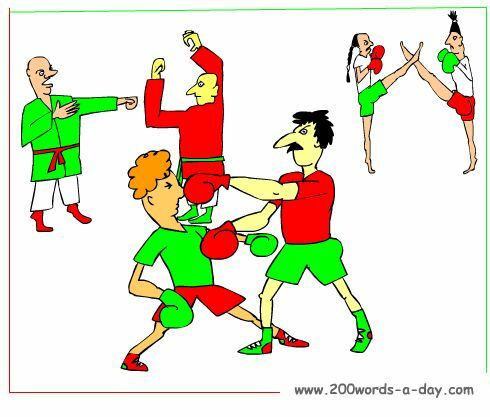 Free Daily Italian Lesson Online - the verb in Italian for fight is combattersi - fully conjugated. Italian Learning Made Fun and Fast with your free Daily Italian Verb Lesson - combattersi.